Dress rings are individual rings that vary dramatically in style. They are not usually given as part of a tradition like diamond engagement rings but are often given as a special gift just to enjoy wearing. 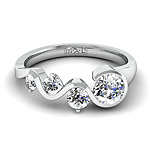 Diamond dress rings purchased from Mad About Diamonds are quite simply top of the range. We make no compromises when it comes to making sure that your platinum and gold diamond dress ring is absolutely perfect. With a state of the art workshop and fully insured UK delivery, all of our diamond jewellery is top class having been hand finished by our very own master craftsmen. 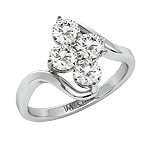 Diamond dress rings are not specifically designed for engagements hence the name. They are truly versatile pieces of jewellery and can be worn whenever you dress to impress. They can be customised to fit any style or design so are often a popular choice amongst those on a budget. 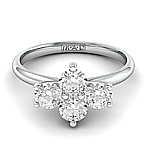 At Mad About Diamonds you never have to settle for second best, whether on a low budget or a high budget. All of the rings at Mad About Diamonds are carefully selected and crafted using expertise and care. Platinum and gold diamond dress rings with UK delivery vary dramatically in style due to their versatility and affordability. A diamond dress ring, although hugely elegant is a piece of jewellery that makes a special gift that can be enjoyed at a range of event and occasions. Don’t forget about the Mad About Diamonds online ring builder where you can ensure your diamond dress ring will look exactly as you wish. If you still can’t get the design you want, just pick up the phone or even draw us a sketch. Purchase your Dress Ring online from Mad About Diamonds. Our personalised service will ensure you get the best possible deal on your Dress Rings!